The new video encoding and decoding standard – VVC (Versatile Video Coding) project is on-going and is expected to be completed before the close of 2020. This project aims at the brand new generation video compression technology VVC that performs even better than the HEVC standard, and claims to enable the delivery of UHD services at bit rates. What is VVC? How to play MP4, MKV or AVI videos encoded with VVC video codec? This guide will tell you something. How to Play VVC Videos without Downloading VVC Video Codec? 5KPlayer, a versatile media player for 4K HDR UHD etc video playback, is now under active development to become a professional VVC video player for Windows and Mac to play VVC videos without downloading VVC video codec. What is VVC Video Codec? VVC (Versatile Video Coding) is a brand-new video compression technology that is under positive development to help reduce video size while not sacrifice the quality. Under this standard, the video compression efficiency will increase about 50% that even gains over HEVC of 40 percent. That is to say, a 1GB movie encoded with VVC video codec will be compressed to around 500MB yet the video image and sound quality will stay the same. 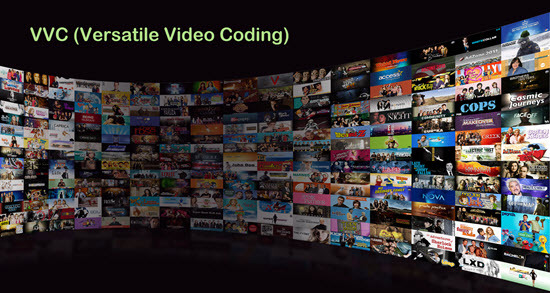 VVC video codec is especially designed to aid in the smoothness of higher-quality video services such as 360° omnidirectional immersive multimedia, high-dynamic-range (HDR) video and conventional dynamic range video. As of now, obvious effectiveness of VVC video codec has been shown on ultra-high (UHD) videos. In the near future, it is possible to enable twice as much 360°/HDR video content as now to be stored on a disk and server, or sent through a streaming service like YouTube, Dailymotion and Vevo. Since VVC technology can improve the utilization of server capacity and hard disk, video providers like YouTube, Dailymotion and Vimeo definitely will offer more video resources for you to download. How to get to deliver the HD movies at 100kbps on Mac/Windows? How to stream a 4K UHD TV episode on computer without requiring a 25Mbps broadband connection? The answer is VVC video codec, of course. VVC video codec is the key to make the high-res videos small and enables your video player to be able to play VVC videos smoothly as well. Where to download VVC video codec free to beef up your media player? We are sorry to tell that there is no trustworthy resource at present for you to get it as VVC project just starts and keeps quite mysterious. Luckily, we know VVC video codec standard will be decided by Qualcomm, Samsung, LG, Nokia, Sony, Sharp, Panasonnic, Dolby, etc companies, and obviously the users of these brands will have the first glimpse of VVC and enjoy its benefits. As for VVC video codec download for VVC video playback, we will update the information immediately once we discover one. Because of VVC, you will no longer to be constrained by the unreliable networks or limited data plans when streaming online videos. At the same time, you can download a large number of data-heavy 4K UHD, 360 VR and HDR videos to enjoy freely on Mac and Windows computer. How to play videos encoded with VVC video codec? The right key to open the VVC files is a professional VVC video player, of course. Before being a VVC video player, 5KPlayer has been a 4K UHD video player capable of playing high-res videos as well as 360 HD 1080p 720p MP4 MKV AVI etc videos. Now, it has planned to improve itself to be a qualified VVC player to help play VVC videos directly on Windows/Mac without downloading extra VVC video codec. Be patient, VVC video player 5KPlayer will come out once the VVC video codec is determined. The real 4K UHD video player for Mac download free to play 2160x4096, 2160x3840 4K UHD videos on Mac smoothly.